May 1 has been saved on our calendars since last Tuesday when LG announced a mobile-related event for that evening. The “save the date” spoke of geniuses and brilliance, which didn’t necessarily make much sense at the time. However, thanks to the official invite to the event that we received today, we now understand the references. 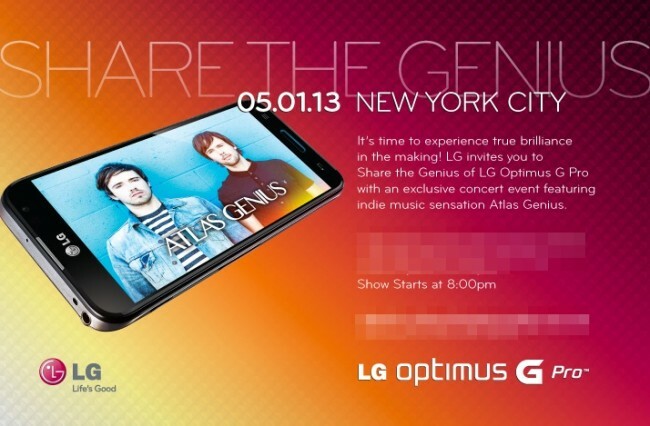 LG plans to announce its oversized device (5.5″ 1080p display), the Optimus G Pro, for the U.S. with a live concert from Atlas Genius. During the event, they want us all to “experience true brilliance in the making,” a reference to the overall package delivered in the G Pro. For those not familiar, the Optimus G Pro is very similar to Samsung’s Galaxy Note 2, yet has pumped up specs in a number of areas, most importantly the display. It also has the newest processor from Qualcomm, the Snapdragon 600, a 13MP camera, and all sorts of software enhancements built specifically for a device this size. Unfortunately, it doesn’t come with an S Pen or anything along those lines. We’ll be there to soak it all in!